Midnite's MNBE-8D2x2 Basic battery enclosure comes with a locking door and a single shelf. 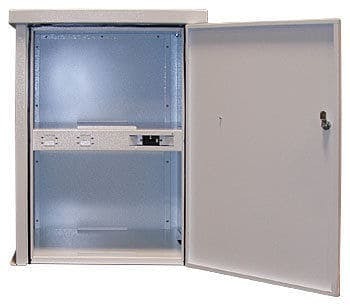 This is an indoor-rated enclosure, however Midnite builds these to Nema 3R specifications with power coated aluminum and stainless steel hardware. The enclosure can accomodate one large inverter breaker (175 or 250 amps) and 4 smaller panel mount breakers (1 to 100 amps available.) This enclosure is designed to fit (4) group 8D batteries such as UPG’s UB-8D battery.